Legacy Building - Cheers to New Roots! Almost 20 years ago a group of Kansas Citians articulated a vision to create a place that would support, honor, preserve and celebrate the Irish and Celtic heritage of our community, families and individuals year-round. Our vision has grown and changed to better meet the needs of our community, and now our location must as well. We have the Plan...We have the Place...Now we need your help. 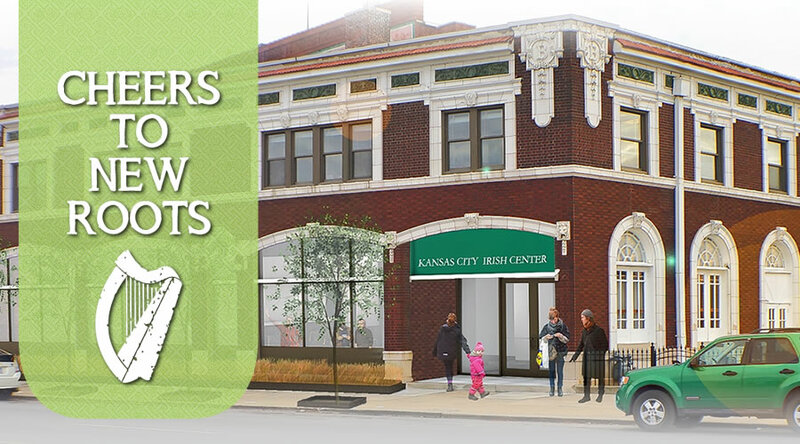 The Irish Center is the living room of Kansas City's Irish community - a small living room, one that needs to upgrade from rental unit to home ownership. Through the purchase of Drexel Hall, we have the opportunity to combine our programs with an existing, successful event space. The Center will gain much-needed space for events, programs, classes and meetings...and most importantly, an ongoing, sustainable revenue source. Located in the heart of the city, Drexel Hall has been a Kansas City landmark for over a century. With a long and colorful history, it is the oldest, continuous in-use ballroom in Kansas City, and historically books 40+ events annually, yielding net revenue of $100,000. Our current goal is to complete the purchase of Drexel Hall in the next couple of months. Once purchase is complete, we will work towards renovations of the existing building to increase our income potential and functional space. This will be a new revenue source, providing a second rental space for small events (up to 75 people); projected to generate $2,500/month through rentals and food and alcohol sales. Includes a small performance stage. This space will continue to be marketed for rental by outside groups/individuals. Capacity is 500; event space seating is 100-400, depending on set-up. All catering will be handled by outside vendors. The event hall also provides the Irish Center an on-site venue for concerts, theatre productions, speakers, etc. Remodeled to accommodate the Irish Center's existing needs - office space, library, meeting/classrooms. Mezzanine of event hall largely unchanged. Right now we have a donor who will match up to $125,000 in donations generated through this campaign. This means any donation you make now will be doubled!